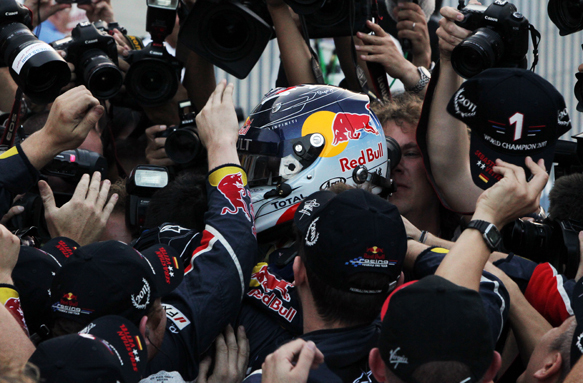 Sebastian Vettel achieved the inevitable at the Japanese Grand Prix: he scored enough points – he only needed one! – to put the 2011 drivers' title out of reach of his only remaining pursuer, Jenson Button, in the final four races of the year. As a result, the 24-year-old German has joined an elite band of champions to have successfully retained their title: Alberto Ascari, Juan Manuel Fangio, Jack Brabham, Alain Prost, Ayrton Senna, Michael Schumacher Mika Hakkinen and Fernando Alonso. 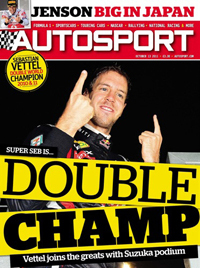 This week's magazine's lead news item is given over to paddock reaction to Vettel's achievements, with high-praise from former champions, team owners and the current crop of racers. Edd Straw reveals how Vettel's pace, maturity, work ethic and popularity could mean plenty more championships in the future – there's countryman Schumacher's record tally of seven to aim for now, of course. Mark Hughes column – Following Button's superb win for McLaren at Suzuka, his 12th in F1, our grand prix editor reminds the doubters of the 2009 world champion's status as a great F1 driver. Korean GP preview – The F1 circus headed straight to Korea from Japan for the second GP at the popular and challenging Yeongam circuit. David Coulthard, Gary Anderson and Lucas di Grassi reveal who'll be making the right noises in the 16th race of the season. Japanese GP report – All the action from Suzuka, including detailed race report, qualifying analysis, technical appraisal and comprehensive results from our team of experts. BTCC finale preview – Five drivers can lift Britain's premier series crown at Silverstone. Kevin Turner rolls the dice for Matt Neal, Gordon Shedden, Jason Plato, Mat Jackson and James Nash. IndyCar showdown preview – It's Dario Franchitti v Will Power for the IndyCar crown in Las Vegas this weekend. Charles Bradley weighs up Franchitti's chances of a fourth title against Power's hopes of a first. Renault 3.5 Barcelona – Peter Mills reports on how the title showdown in Spain between Robert Wickens and Jean-Eric Vergne went the way of the Canadian, who took the title for Carlin. British F3 Silverstone – The final meeting of the season led to a seventh win of the year for Kevin Magnussen, a reversed-grid victory for a returning Alexander Sims and a maiden triumph for Colombian Carlos Huertas. Ben Anderson watched them all. IRC Rally of Scotland – The third running of the Intercontinental Rally Challenge event marked a maiden win for Norwegian youngster Andreas Mikkelsen and Skoda UK. David Evans reports. Bathurst 1000 – One of the greatest 'Great Races' on record was a last-gasp cliffhanger between Holden aces Garth Tander and Craig Lowndes. Phil Branagan was at Mount Panorama. From the archive – Remembering Francois Cevert's first and only F1 win for Tyrrell at the 1971 United States GP at Watkins Glen. Race of my life – Italian Max Papis looks back on his only FIA European F3000 victory – at Barcelona in 1994 – just weeks after his friend and mentor Ayrton Senna died at Imola.